All the information and knowledge you need to pursue your passion for coffee. 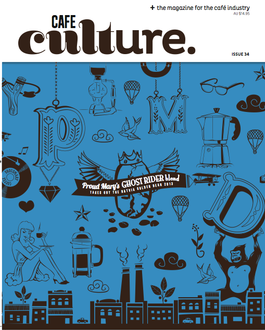 In it's tenth year, Cafe Culture is the most comprehensive cafe industry magazine in Australia. Produced quarterly, we provide a vast amount of practical information reproduced in full colour. Features include tips from the pros, road tests, competitions, reviews, tutorials, suppliers' guide and industry gossip. Printing 11,000 copies every issue, the distribution stretches throughout Australia, New Zealand and also South East Asia. Fantastic magazine to have a flick through to find out whats going on in the industry.